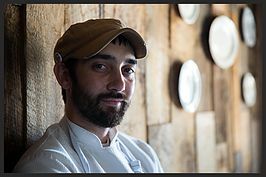 Clark is the Chefs Collaborative Local Leader for Charlotte, NC. What policy change have you been working on in Charlotte, NC? In North Carolina, we function under the 2009 food code which makes it illegal to serve any mushroom outside of USDA or NCDA inspected facility, such as commonly farmed shiitake and button to wild mushrooms. I have been working with the North Carolina Environmental Health Services for the past two years to create a system where chefs can serve wild mushrooms and lessen the restrictions on small mushroom farmers. This system should go into effect on January 2017 when the legislature returns for their next session. As a chef, why are wild mushrooms important to you? I love mushrooms – the diversity of their flavors, the way their mycorrhizal system functions. I find it fascinating! I’ve been foraging for most of my adult life and believe the flavors of wild ingredients give chefs the ability to tell the story of their locale far more effectively than conventional ingredients. North Carolina chefs should have the right to work with wild mushrooms and small mushroom farms to open a wide range of flavors and develop relationships, respectively. What recommendations would you give to other chefs trying to make policy change in their cities? 1. Form partnerships with individuals or organizations in your area already working on the topics you’re interested in. I found foragers and people in the local health department who are interested in mushrooms and have worked closely with them. 2. Don’t give up. I worked on this project for over two years before we finally had a breakthrough. 3. Be loud and unafraid about what you believe. The action that finally pushed this issue to the forefront was a front page Charlotte Observer article where I called out our local legislature on the issue and said that we would continue to serve wild mushrooms, regardless of the legal standing.